I am the original cookie monster. Tell me there’s a holiday party and I’m there with a plate of cookies. I can’t say I never met a cookie I didn’t like. I’ve had a couple of cookie experiments that were barely good enough for dog biscuits (like the cookies in the lower left side of the photo above, a failed attempt at a low fat peanut butter cookie). But I love cookies for much the same reason I love muffins – they re nice measured units. You can eat them and know just how many fat grams you are eating. Eat a 3 gram cookie and have 3 grams of fat; take 2 and have 6 grams. You can easily fit them in as a snack. I try to keep my cookies between 2 and 4 grams of fat/cookie. One of my Principles is that snacks should be 4 grams and under, so that you can eat lots of them. You can also freeze most cookies, so you can create a freezer full of carefully-packed snacks to take out when the midnight munchies hit. And of course, most of the time cookies are delicious. Chocolate Cherry Chewies are the cookie that everyone says “these can’t be low fat” about. 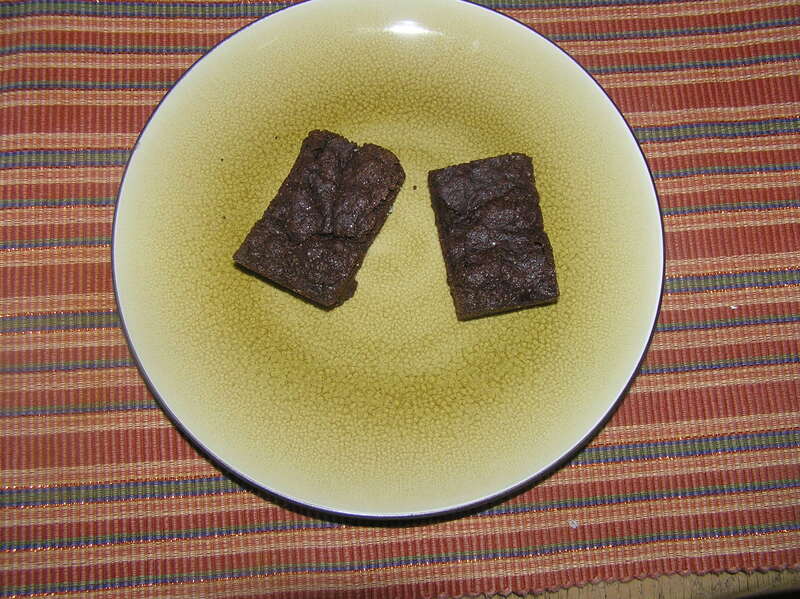 They are VERY chocolaty, the outside is kind of crisp and the inside is chewy and melty. They keep and freeze well. The original recipe came from Cooking Light. Preheat oven to 350 degree.s Coat baking sheets lightly with cooking spray. Lightly spoon flour into measuring cup and level. In a medium bowl, whisk together flour, cocoa, baking powder, baking soda, and salt. Place butter and sugar into large bowl of a mixer and beat at high speed until well-blended. Add vanilla and egg and beat well. Reduce mixer speed to low and gradually add flour mixture. Be sure to scrape bowl and beaters. Fold in cherries and chocolate chips. This makes a very stiff dough that you can almost shape with your hands. 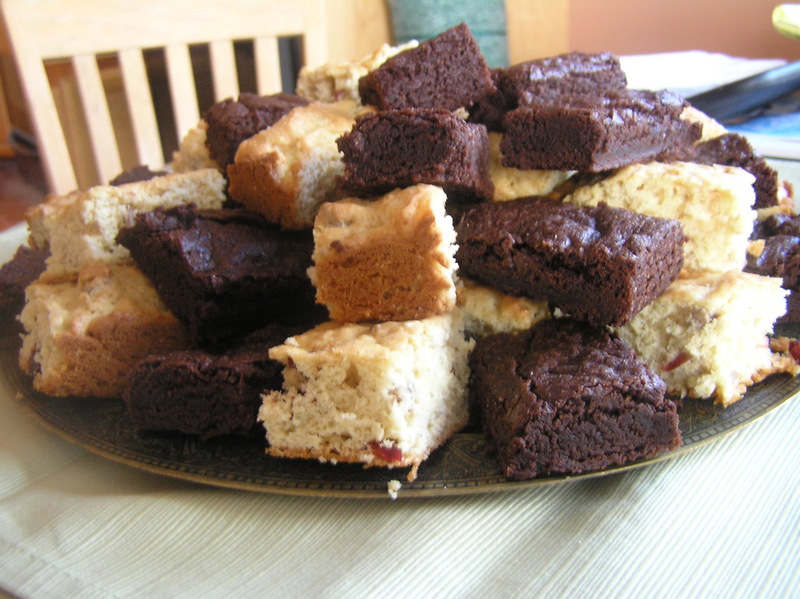 Drop by tablespoonful 2 inches apart on prepared baking sheet. Bake at 350 for 12 minutes or just until set (tops will begin to crack). Remove from oven and cool on pan for 5 minutes to allow cookies to firm up. Remove from pans and cool completely on wire racks. Makes 30 cookies with 2.7 grams of fat/cookie. Variation: I often make this with dried sweetened cranberries rather than cherries, because the cherries are sometimes hard to find. They’re just as good. You know you’ve had those days. Your stomach feels gorpy. You spent an hour on the phone arguing fruitlessly with a customer “service” representative about your account. You’re one step shy of a migraine – or maybe you already have one. You accidentally hit your finger with a hammer and broke it. You need muffin therapy. Just the word muffin is cozy and comforting. Muffin – muffin – muffin. Doesn’t that sound like a warm down quilt, wooly socks, and hot tea? And bananas, that comfort food from childhood. And of course chocolate – aaah chocolate. It needs no introduction. Now don’t go telling me that we need to learn to not seek comfort in food. That just not realistic. Everyone knows that misery loves calories. The trick is to have something gooey and satisfying on hand that also is not really high fat. Preheat oven to 350 F and place rack in center of oven. Spray a 12 cup muffin pan with cooking spray. Whisk the flour, salt, and baking soda together in a medium bowl. Put the bananas into the large bowl of an electric mixer and beat them until they are well mashed. Beat in the egg substitute. Beat in the sugar. Add the flour mixture about 1/4 cup at a time, until it is incorporated into the banana mixture. Beat in chips. Spoon the batter into the muffin cups until they are about 3/4 full. Bake for 18-20 minutes. Remove from oven and let cool 10 minutes. 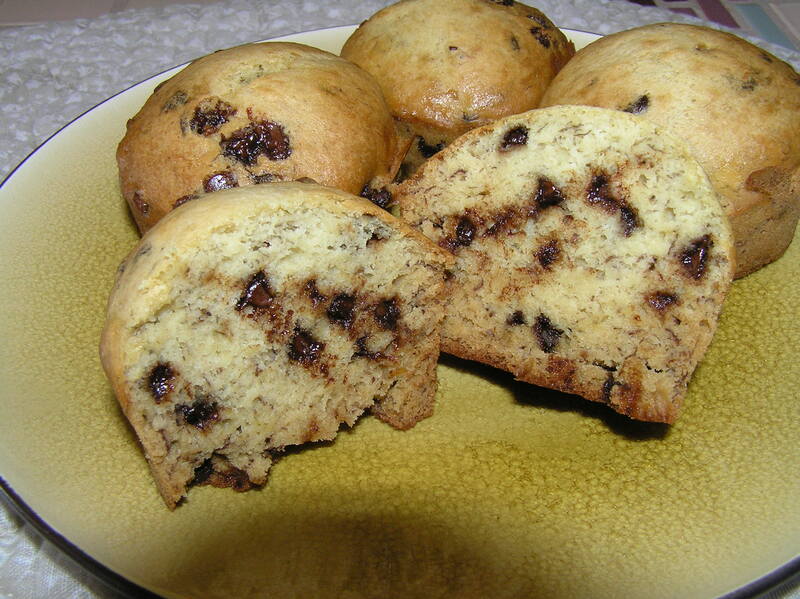 Remove muffins from the pan and cool on a rack. These are delicious warm, and can be gently reheated in the microwave. They also freeze well, although I rarely have them left to freeze. These muffins are about 2.6 grams of fat/muffin. Eat two – you’ll feel better. 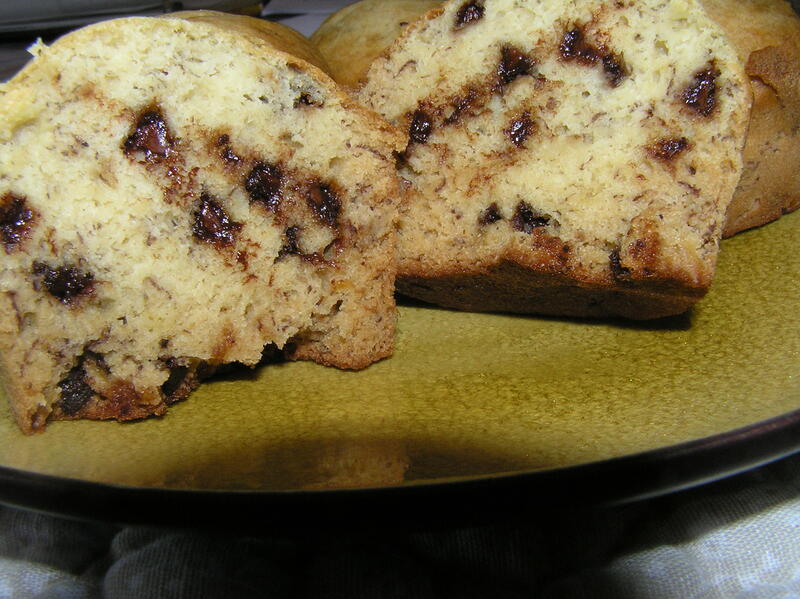 Variation: You can use regular size chocolate chips, which will make nice big gooey areas of chocolate in your muffins. I like my chocolate spread around more. Come close. Note the gooey melty chocolate in the muffin. I must go now. The muffins are warm and require my undivided attention.